Antonio Colombo Arte Contemporanea is proud to present in Little Circus, the gallery space dedicated to special projects, How To Eat Spaghetti Like A Lady, the solo show of the Italian illustrator Olimpia Zagnoli, curated by Chiara Pozzi. The stars of this new series of works, created especially for the exhibition, are women, that Olimpia, with her usual freshness and essential nature of lines and colors, depicts in the act of subverting the rules of conduct that they are usually required to follow in public. The show “How To Eat Spaghetti Like A Lady” overturns the series of photographs of the same name taken by Alfred Eisenstaedt, published in the American magazine Time Life in 1924, which is presented as a tutorial made of eight close-ups portraying a charming model in the act of composedly consuming a plate of spaghetti. Olimpia, who in her illustrations favors the representation of soft, amused and colorful women, gives us a brilliant interpretation of the meaning of “like a lady”, thus drawing a series of portraits of girls who are tasting their plate of spaghetti in a completely singular and authentic way. Distant from established rules of conduct, from unnecessary poses or conventions, the women reveal their creativity and an unexpected and personal attitude. 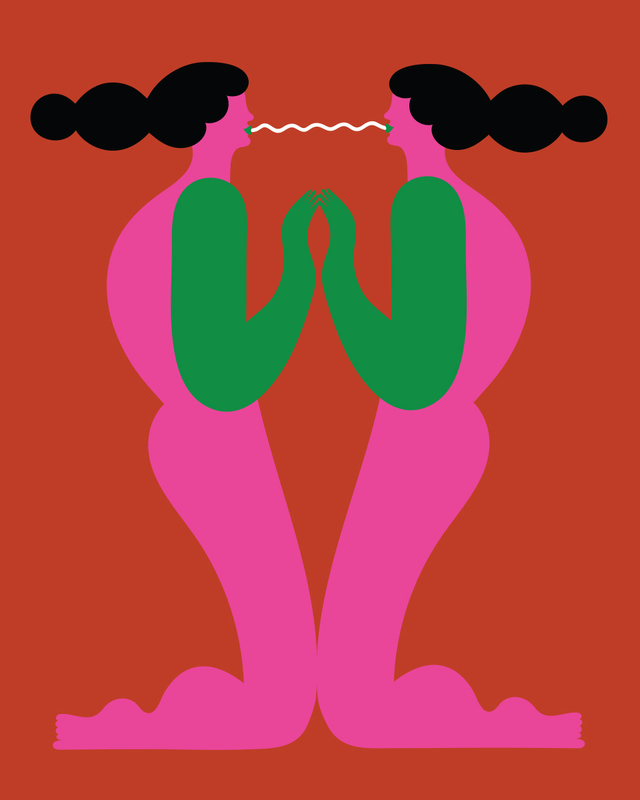 With her works, Olimpia Zagnoli opens a window through which we can glimpse a fragment of the moment when, in their domestic intimacy, women voluntary forget the precepts of their education. And it is exactly at the same time that “they do what shouldn’t be done, they create new paths and new languages. There will be the woman who eats her spaghetti in bed, the one who eats them upside-down, the one who weaves them with her own hair, and so on”, says Olimpia. Co-star of this series of works, especially in the screen prints, is color. The figures are shaped by essential and geometric lines, that meet flat and bright backgrounds. A chromatic proficiency, nourished with the observation of the great masters of graphic design and art, and then accurately re-elaborated into a personal visual language. The result is a fresh and essential work, with simple images able to communicate and represent a concept. 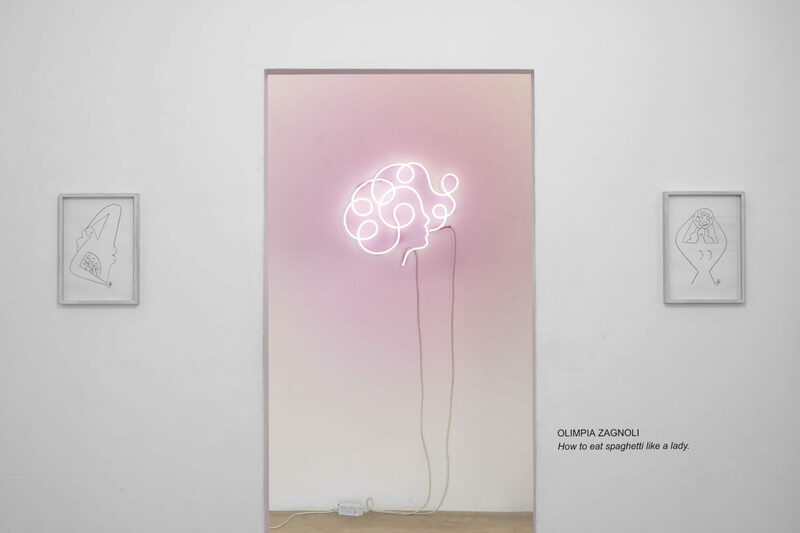 In her ongoing artistic research, based on the relationship between drawing and three-dimensionality, Olimpia will present for the first time a neon sculpture. Also, in the gallery will be present original works on paper and limited-edition screen prints. Olimpia Zagnoli was born in Reggio Emilia in 1984. She lives and works in Milan. In 2007 she receives her degree in Illustration from the Istituto Europeo Di Design in Milan. As an illustration, she works with major newspapers and international magazines, such as The New Yorker, The Guardian, The Washington Post, The Wall Street Journal, Le Monde, Marie Claire, Vanity Fair, Internazionale and La Repubblica. She designed covers for Chronicle Books, Basic Books, Penguin Books, Salani and Taschen, and illustrated books for young adults and children. In 2015 she designed a set of stamps for the Republic Of San Marino, on the occasion of World Kiss Day. She collaborated with important brands in the fashion world; recently she designed for Marella a capsule collection called TropicOz. Among the many group exhibitions she took part in, it’s worth pointing out in 2016, Una Storia Americana. Two Italian illustrators in New York and in the same year Cover Revolution! Gli illustratori e il nuovo volto dell’editoria italiana, both at the Istituto italiano di cultura in New York. Among her solo shows, in 2016 La Grande Estate, Mutty, Castiglione delle Stiviere (MN), in 2015 Cinetica Zagnoli Elettrica at 121+ in Milano and OzaZoo at Zoo gallery in Bologna, in 2014 Parco Zagnoli at Nina Sagt gallery, Düsseldorf (Germany), in 2013 Affiche, organized by Spazio Tapirulan, Cremona.